The original version of this post appeared on August 23, 2007. 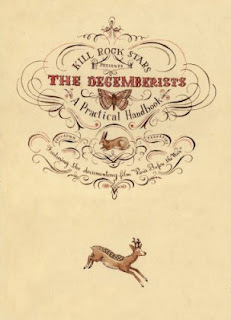 At the recent Family5000 Reunion, Niece #2 went out shopping and came back with a copy of the concert video The Decemberists: A Practical Handbook. And really, that's a pretty good story right there. Because YOUR nieces probably listen to, what? The latest crippy-crap Brittney Spears clone that Central Marketing has mandated as this year's teen sensation? Or, if you're lucky, thug hiphop lite? Well, MY neices listen to the Decemberists. Envy me. Anyway: Nieces #1-3 troop off to screen the video. But then, Niece #1 reappears almost immediately to tell me I better come take a look at this. So I follow her upstairs. In the screening room, my brother-in-law solemnly restarts the video. The opening shot: the Roseland Theater's sign reflected in a mud puddle. The second shot: the Roseland Theater sign, right side up. 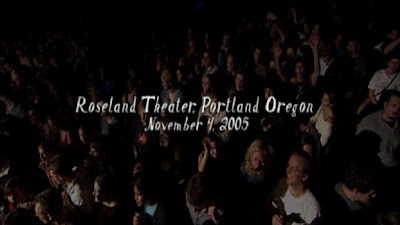 The third shot: A caption reading "The Roseland Theater, Portland, Oregon, November 2005"
And then, the surprising fourth shot: Myself and Mrs. 5000. Granted, we are seen at the beginning of a pan across the crowd. We are two people among many. But, we are easily the most prominent people in the shot. We are visible for litterally seconds. Now, it must be said that several times during the reunion, my nieces witnessed me doing things that were not only solidly adult, but arguably quite square. For example, I was visibly excited to receive a water filtration system as a birthday gift. I demonstrated concern about safety on several occasions. I may have discussed property values. I occasionally used the word "square." Given this kind of thing, and yet that one always hopes for some quirky-but-maybe-kind-of-cool-uncle cred with the nieces, it certainly can't hurt to show up in their rock videos. 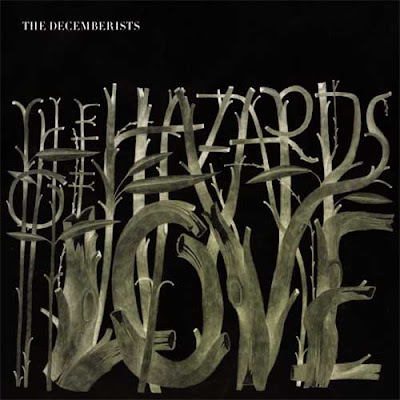 Back here in 2009, I'm putting this post together while listening to the new Decemberists' album, The Hazards of Love. You likely either already know about it, or don't give a damn. For the record, though, it is growing on me almost immediately despite its proggy indulgences. Well, about the music I probably don't give a damn, but possibly this is a character flaw. However, I AM interested in the word "proggy." What? So what about the water filter? This definitely makes you the coolest uncle in the world. Awesome. I have been away from the outside world in babyland, so I hadn't heard about the new album. I will have to check it out. @Elaine: "having characteristics of the so-called 'progressive rock' genre of the 1970s." @Saved: The water filter didn't really work out. Couldn't hook it up to our plumbing. @Melissa: Warning! Bad things happen to babies on this record! I see you! I recognized you immediately! You're famous!